They say never to judge a book by its cover; how very true, and yet that does not excuse a dull and drab-looking facade just because your interiors are exquisite and ultra stylish. The truth is that your house’s exterior also needs to be in tip-top shape, not only to show everybody that you take your style and look seriously, but also to boost your neighbourhood’s value. After all, what good is living in a safe and charming suburb if your house looks like it’s slowly but surely decomposing? Today on homify, we are looking at 6 ultra fabulous facades. From modern and gorgeous to rustic and beautiful, each of these flaunts a look and style that speak volumes about the house’s level of sophistication. Will you be able to gather some inspiration for your own house? Or will you just enjoy staring at these stunning houses with their impeccable surfaces? Isn’t Mother Nature just grand? Allowing us to enjoy her lush presence in an abundance of styles and spaces, whether it’s a dense forest, a striking backyard garden, or a vase with some fresh-cut flowers adorning our interiors. 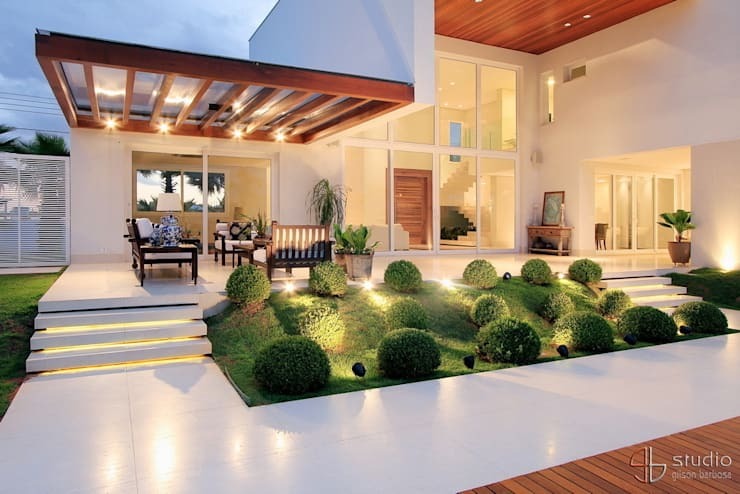 Why not bring a little fresh greenery to your exterior spaces by opting for a stylish garden? This backyard terrace above, courtesy of professional photographers Studio Gilson Barbosa, shows us that a dense and lush abundance of plants is not necessarily the best way to go. Patches of expertly maintained lawn, and a handful of shrubs and potted plants, add some tranquil style to this facade, contrasting most deliciously with the crisp whites and caramel browns of the house’s materials. We are all, to some extent, familiar with the concept of the vertical garden, but have you ever considered adding it to your house’s facade? Just see how exquisitely well these modern timber shutters and lush patch of fresh greenery go together, adorning this modern house’s exterior surface with eye-catching effect. In addition to “looking pretty”, plants also bring forth a variety of health benefits (such as purifying air), plus they go pretty far in setting up a cool, tranquil atmosphere (which, as you can undoubtedly agree, is vital in today’s deadline-driven world). 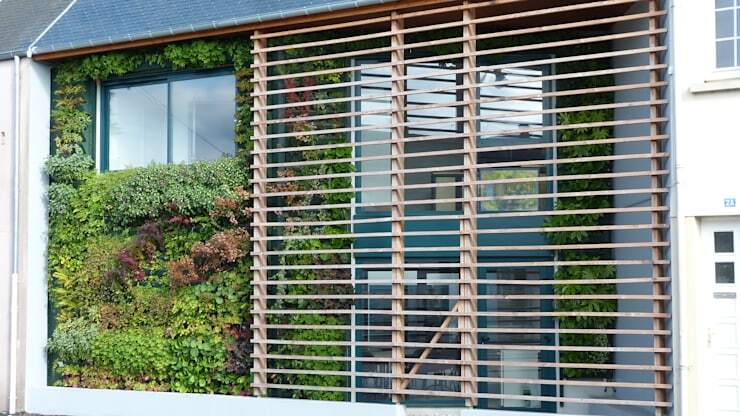 Will a patch of vertical garden go with your house’s facade? Wood has definitely made a name for itself as a tried-and-tested building material. But just because you admire the strength and/or beauty of wood does not mean that you have to opt for a house made entirely out of timber. 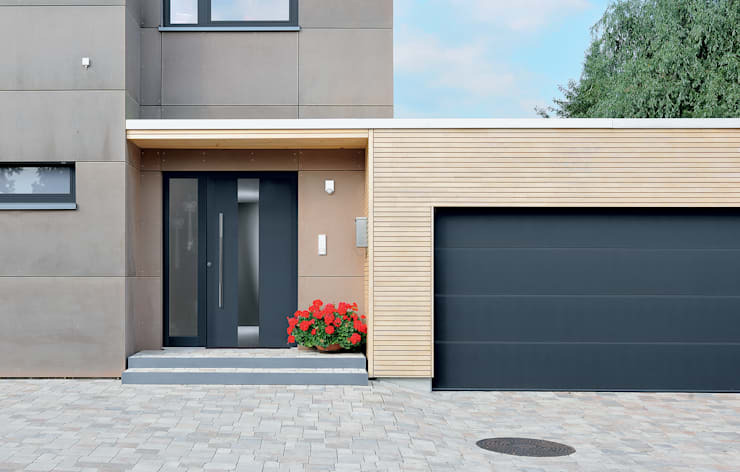 Case in point, this stylish and modern facade above, which flaunts only a select volume of wooden panels (in this case, adorning the garage’s facade), making those wooden surfaces all the more striking. The timber touches no doubt add an appealing affect to this house’s front side, yet should you want to go with something similar for your own facade, we suggest you keep in mind the corresponding treatment and maintenance that come with enjoying an eye-catching wooden surface, particularly on the outside of the house that comes in contact with the elements. Seeking something less opaque and more transparent? Glass, you’re up next! Glass can adorn and construct just about anything these days, from windows and doors to staircases and floors. 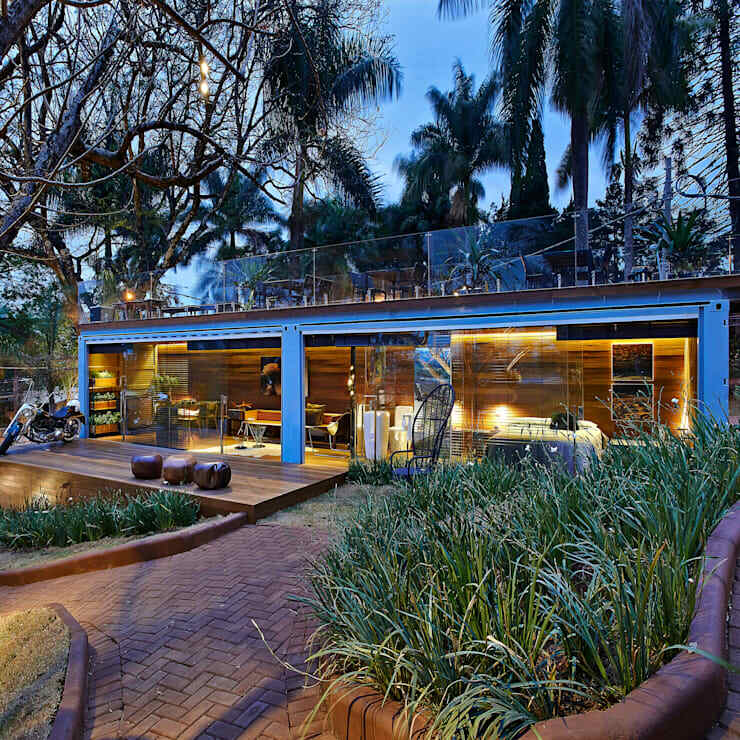 Just see how fantastic this modern house enjoys a strong link with its scenic garden, thanks to those generous glass surfaces. Plus, glass can become your best friend if you’re looking for ways to introduce some more natural lighting into your home. But if you’re going to go big, be smart and opt for a north-or south-facing glass surface as opposed to west or east, as too much sunshine and UV rays can result in a hot and toasty indoor space. There is no need to display what goes on inside your house (or yard) with the outside world. If privacy is what you seek, then you shall find it – in this case, with a delectable stone wall and sturdy metal gate. A stone-surface wall adds a fantastic touch of rustic to any space, yet a lot of modern and contemporary homes also opt to adorn select surfaces with this fantastic material. 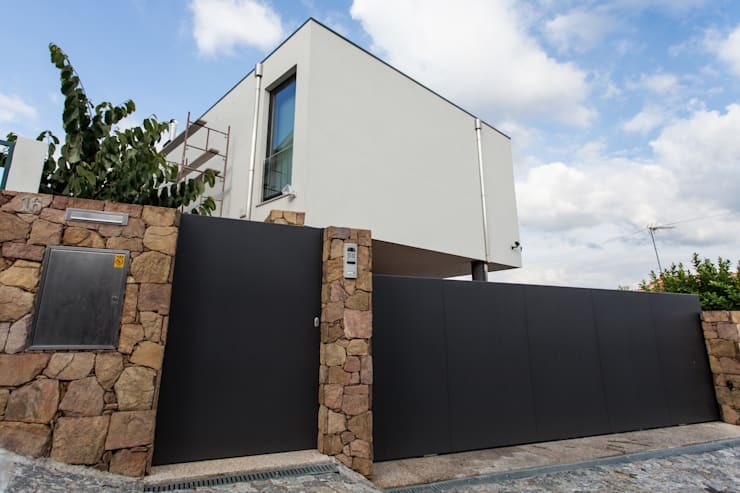 One of its many advantages is that its’ available in a wide range of styles, sizes, and colours, so you can be sure that you’ll find the ideal stone(s) for your house’s facade, whether it’s for the security fence or exterior wall. Speaking of stone, we want to showcase just how modern and stylish this building material can get, which is why we’ve dedicated the last option in our facade article to it as well. From granite and marble to sandstone and brick, opting for stone for a house’s facade means you are choosing a sturdy and reliable building material – and beautiful, of course. 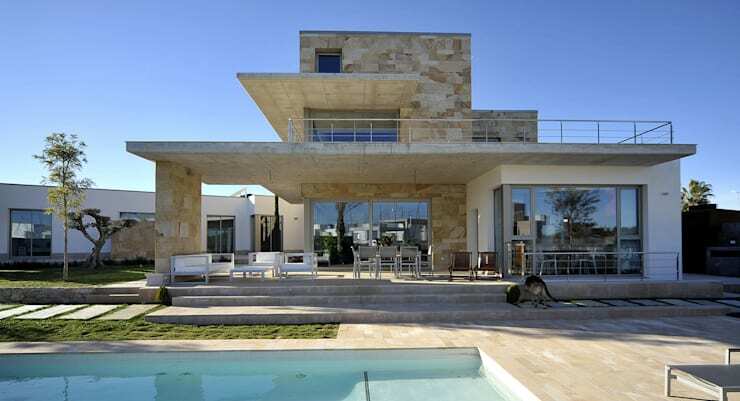 Just see how this Mediterranean house above compares with our previous example of stone surfaces. Speaking of beautiful facades, have you seen: The Sunshine House? What’ll it be for your house’s facade? Garden? Stone? How about some wooden panels? Share your thoughts with us in our comments section, below.